Superstar Rajinikanth playing main lead role in the upcoming film titled Kabali is progressing with its shoot schedules in Goa. 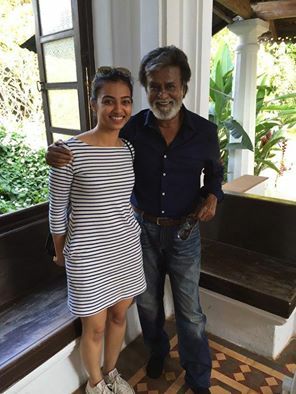 The latest news is that Radhika Apte has joined the sets of Kabali film in Goa and the actress is excited to share a picture with the recent to her fans. Radhika Apte is said to play the role of Rajini's wife in this commercial action thriller. Pa Ranjith is the director of this gangster based drama which has tunes by Santosh Narayanan. Kalaiarasan, Dinesh, Dhansika, Gopi et al are playing supporting roles. Kalaipuli S Thanu is the producer of the movie. Write & Share about "Radhika Apte joins Kabali sets | Kabali Tamil Movie News | Cinema Profile" !